If I Make Sound, I Exist? Starting life in the situation of not being allowed to speak, made it easy for me to see that many people were taking it for granted. They could speak so easily, and how I wished I could too…. But they were playing ‘verbal table tennis’ with it I thought, and completely wasting it. Did they not know how it created our lives? Language is our greatest creative tool. Self mastery is knowing to carefully choose from our thoughts which ones to ‘activate’. When we decide to speak, we shape our sound that is our emotional state and we give it recognizable meaning. Each vocal expression, shares with the Universe and everyone in audible range, our emotion, intent, soul essence, declaration – by way of our chosen series of words or ‘spell’ – and ALL in a unique combination of sound frequencies that are carried on our breath/ life force. A ‘spell’ is simply a carefully chosen series of words, spoken with intent. There is NO difference between a spell, and every day speech, using our language with full creative power ability. All throughout English history there have been developments in language but all stemming from ignorance as to the greater point of Human language ability. Lots of silly repetitive phrasing double negatives, puns and jokes and slang and more….but when we come down to it, we do need to be learning how to speak again!!!! I find the English language construct inadequate for our intellectual reasoning developmental ability anyway. I am extremely concerned with what occurs when English is even further limited as is common in Australia with the chronic shortening of words. Many of us now, particularly English only speakers, suffer to varying degrees from a ‘chronic deficiency syndrome’ or a marked reduction in functioning and development because of a severely reduced vocabulary. As Humans we are our language. I was not allowed to develop speech and after surviving all attempts to harm me, needed this ability when I lived to school age, and started school. Children tormented me when I was not able to say my name in front of the class as we were all made to do the first day. Very shy and not wanting to be bullied or teased any more, I quickly learned how to ‘get through’ life with minimal speech. And every coping strategy I could creatively design to seem as though I did not have enormous speech problems. How I wished I could speak with ease, but I was able to get the insight with ease instead, as to what speech we actually need as humans, and what speech is adverse or negates creating our best life! 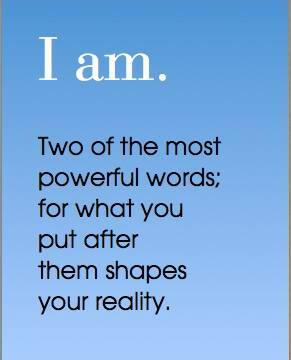 “I am” is our greatest creative building block we can use. When we make a negative comment we waste our creative ability. We can speak, and totally negate any creative intent simply by incorrect phrasing! Try instead to aim to speak maximizing your creativity. Silence is pretty cool too! Do you need to comment to something – or would silence make a more amazing impact? Silence shapes our sound. Silence assists activation of our chosen phrases, giving them greater power. Begin with intending to speak what is your truth. You are not designed to only be saying what others say. Chances are you are able to speak without the problems I had, so what if you could have a much better life, just by speaking differently? It is a miracle, use it wisely! Do you need to make a comment – or would silence make a more amazing impact? Perhaps silence IS the answer, allowing you to receive respectfully and ponder it.more deeply? Silence enables us the space to receive messages and choose from our thoughts. Silence gives us a safe place where we can check in on our Self. Some people find silence too scary and threatening, if they do not know how to face what comes to them in that space, or how to deal with the energies there, that are waiting to leave us.